I had of course heard/and read about Bill Kaysing, yet I'd never fully realized what an extraordinary man he was and that he surely must be considered as the 'founding father' of the Moonhoax exposure. I have now read a lot more about this great man and feel compelled to dedicate a respectful tribute to Bill - in the form of this discussion thread which I do hope will help spread awareness of his pioneering work. Bill Kaysing passed away in 2005 - still largely unknown and ridiculed by a slimy horde of idiotic detractors - but I have every reason to believe that he will one day be hailed as one of the greatest men to have walked (with giant leaps) on this planet. It was quite astonishing for me to realize that his book was first published barely two years after the last phony, alleged moon mission (Apollo17) - yet it already contained comprehensive and undeniable proof of the Moon Hoax or, as I like to call it, "the Mother of TV fakery". One can only imagine the perps' dismay to see their multi-billion dollar hoax exposed in 1974 - just as they started planning their next Space Shuttle Skulduggery. We can also only imagine the amounts of (taxpayer-) money and efforts spent by NASA (and assorted clowns) over the years to bury Bill's book and keep it from going viral among the thinking people of this world. You've gotta love the timing of that FOX docu - which certainly does more harm than good to Bill Kaysing's credibility. I sat and watched the links Reel Deal had provided a few weeks ago. As somebody that had purchased "The Dark Side of the Moon" by Percy & Herbert many years ago, much of the content was well known to me. However, I had forgotten just how far Kaysing had gone out on a limb for somebody that had worked in the industry. I would love to see some research into his claims I think from one of the A17 astronauts that he felt wanted to talk to him. 3 months later, he and his wife were both dead. Foul play or a hoax within a hoax? For anyone who has trouble in teaching their friends or family that the Apollo missions were a great hoax, there is an excerpt of two A11 astronauts shadows changing length as they move closer or further away from the light source. Something that cannot be replicated by a constant light source such as the sun. Having watched so much of the fake footage with its inherent mistakes, I am convinced that it was the work of disgruntled employees. I feel that a lot of the 9/11 errors are the same thing. We can only keep pushing the real truth and hope that things change before we too, depart this world. Why does this thread about Bill Kaysing seem to be unpopular? For chrissakes. folks! This gentleman unveiled the Moon Landing Hoax only a couple of years after Apollo 17 !!! What's wrong with this planet? I have some of his books and I can say he comes across as legitimately caring for the human enterprises of truth and freedom. Unlike those running our political establishment, who care only for their position of power and - possibly - a vague sort of idea of fulfilling some human want for justice that is utopian and doesn't need to be fulfilled. Our system is corrupted and broken. We must find a better way to utilize our brilliance and ingenuity. Mr. Kaysing inspires us to try. SmokingGunII wrote: Having watched so much of the fake footage with its inherant mistakes, I am convinced that it was the work of disgruntled employees. I feel that a lot of the 9/11 errors are the same thing. I think it is much more reasonable to assume all faked crap results from the contempt that TPTB have the gullible American population. hoi.polloi wrote: I have some of his books and I can say he comes across as legitimately caring for the human enterprises of truth and freedom. Unlike those running our political establishment, who care only for their position of power and - possibly - a vague sort of idea of fulfilling some human want for justice that is utopian and doesn't need to be fulfilled. Our system is corrupted and broken. We must find a better way to utilize our brilliance and ingenuity. Mr. Kaysing inspires us to try. From what I've read about him, he does seem to have been a genuinely decent and thoughtful man. I'm about to get myself a copy of his book too. We never went to the Moon. Bill Kaysing just about proves it here, and he was one of the very first to ever have done so. 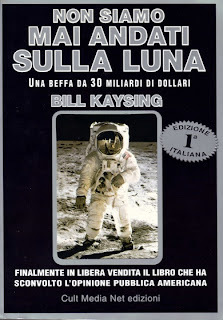 Kaysing was working on the periphery of the Apollo program at a facility in Nevada, and he offers some interesting and quite specific first-hand facts, and even more interesting and quite specific conjectures, that you generally won’t find in later books and DVDs which further corroborate Kaysing’s work on the Apollo Moon Hoax. This book intersperses Kaysing’s writing with a lot of black and white photographs and media clippings of the time, and from pertinent sources. Nevermind what the propagandized majority says, Kaysing was truly prescient. We never went to the Moon. Deal with it. Unmesmerize yourself from an American mainstream media system that would have made Goebbels ecstatic. With every passing year that we don’t go back and haven’t gone back to the Moon, Kaysing’s original work is more and more verified. Just watch and listen to some rare, truthful and honest gentlemen ... it is a soothing experience! I hadn't seen this whole video when I posted it but I've now watched the whole thing. It's got some great little gems of information about the Apollo hoax, thngs that are seldom mentioned elsewhere. Last edited by lux on Mon Jan 28, 2013 1:35 pm, edited 1 time in total. The above excellent video compilation contains a brief crucially-important segment of film purporting to show the landed Surveyor probe as Apollo 12 glides sideways into landing. It's utterly unrealistic, but must be open to masses of analysis, providing a (unique?) set of visual references. This can only be a matter of seconds before the 'landing', but it appears to perhaps give derivable info on track, trajectory, ground clearance and speed. Also, orientation of the landed surveyor probe versus the A12 ground intercept. Why has this stunning bit of footage never been seen before? Sorry, Icarusinbound - but which video compilation are you referring to? icarusinbound wrote: ...Why has this stunning bit of footage never been seen before? full link: http://www.youtube.com/watch?v=q7pzg9xpAOE , especially from about 20min55sec to 21min05sec. I feel that Apollo 12 was so differently-scripted from Apollo 11, partly because of the strange on-foot interaction with the supposed Surveyor moon probe. But that aside, can the probe help us debunk the landing, acting as a mileposts checker, as per my above suggestions? (Please also have a look at my recent input regarding Apollo12/ Surveyor3 photo anomalies, at http://cluesforum.info/viewtopic.php?f=23&t=59&p=2380648. I'd really appreciate any feedback on my marked-up comparitive-angle pictures, and opinions regarding the value in analysing the unique 'interactions' between the Apollo 12 players, and the neglected Surveyor 3 1966 probe).